I wrote earlier about tips for hotels and AirBNBs naming things like desk space, amenities, good illumination and more, but let me add some things I would like to see in every unit (and listing) for AirBNB hosts, not all of which apply to hotels. So many places don't have enough plugs for the modern electronics-laden technomad. So get some power strips. In particular, get the ones that have universal sockets which take US, Euro, UK and Aus/China plugs. Yes, I bring adapters but it's always nice to have some extra plugs. 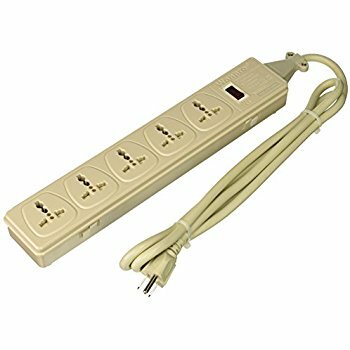 Put one of these power strips by the bed (especially if the plugs by the bed are occupied by lamps and other things.) Put one by the desk space -- you do have desk space, right? What is the most important feature of your unit? Most of the time it's the view or the location, though also high on the list are its internal quality (fancy and new vs. older and plain,) the living space or the kitchen. But while everybody wants a place with a nice kitchen, living room and bed, few are shopping primarily on that. Pick the most important feature and make it your main photo. Possibly combine two photos for that main photo. However, if you choose to show the view, make it a realistic photo or include one after. If you show the location by showing a nearby sight, put text in the photo saying "Near to this" or similar. When I shop for properties, that main photo should grab me. If I'm looking for a view, that's probably what you want to show me. On the other hand, while location is important to me, AirBNB is already showing me that. Having a picture of the famous local landmark is pointless, unless you can see it out your window. It is important that your photos be realistic. Many are tempted to photograph things to make them look bigger than they are, or to hide something. Don't do it. People will be disappointed and leave you bad reviews, which is worse than an unflattering photo. Yes, your "competitors" are using misleading photos but in the end they will pay for that. This is particularly true when photographing the view. Don't take a small view only visible if you lean out on the terrace and crop it to make it seem like the view from the property. If your view is only from the terrace, use a wide angle to make it clear you're standing on that. If the view is inside, take some photos inside of the window, showing what you will see walking around the room that has the view. Photos of rooms should not be super wide angle (that makes the room look bigger than it is) but photos of the view often should be. If you include photos of nearby things, like the town's main tourist site to show that you are near it, mark these photos as "Not from the home, 200m away" or similar. You should show your "view" even if you have no view. People should know if the unit looks out on a courtyard or back street, and what it looks like. You may be surprised -- even a quiet back street may be exotic to the tourist. When shooting inside including the windows and view, use a camera with an "HDR" mode (most phones do this now) or get some HDR software so your photo can show the inside and outside at the same time. And seriously, no crappy, blurry photos. I know you're not a professional photographer but today's devices make it easy to get a good shot if you hold reasonably still. You're trying to make serious money -- borrow a friend or their camera if you have to. Throw in photos of the amenities I describe below, if you have them, to let people know they are there. If you rent your place for longer-term tenants, consider a photo of a floor plan, if you have one, or sketch one if you can. When renting for more than a week, this is very handy. Many AirBNB users are older and don't want a unit where they have to walk up 4 flights of stairs, or even 1 in the case of those with a mobility problem. AirBNB lets you say "elevator in building." which is good, but it should really be "Elevator in Building OR unit is on ground floor" -- and I think that people should actually check that box for ground floor units until AirBNB fixes that. Of course be clear in the listing on that, or on how many floors the guest will need to climb, and whether there will be assist for luggage. Have a clothes dryer. I'm looking at you, Europe. Most Europeans don't have dryers, or at most they have a thing that pretends to be a washer/dryer combo but still requires putting things on a line to dry after. It's hard because most homes are not set up with a dryer vent. Nonetheless, do what you can to put in a real dryer. It's not green, but people who are on the road do not want to spend valuable time hanging and unhanging clothes from lines, worrying about the rain or taking a day to get their clothes back. Since hotels will charge $100 to do a decent load of laundry, an airbnb with a washing machine is a great bargain on laundry days. But vastly more so if the drying can be done quickly and properly. If line dry is the only option, make it as easy as possible. Stock high quality clothespins if I'm going to have to hang clothing out on a line where it might blow in the wind or fall. Marketing your property as close to the beach? Equip it with some beach towels, beach mats and a sun umbrella, and possibly some folding chairs. These things are actually pretty cheap to buy, and will make the guest feel more like a local. You might even want to consider fins/mask/snorkel though these come in different sizes which makes it harder to supply them. Some places the tap water isn't safe, or doesn't taste very good. Sometimes it is safe and people fear it anyway. But certainly in the former case, stock the fridge with some big bottles of water. It's cheap and easy. You don't need to supply enough for the whole stay, but it's nice to have some water right then on arrival, and usually very cheap for you. Some hosts are renting out a lived-in unit, which means the cupboards and drawers are filled with stuff. That's OK, but if it is the case, consider getting a cheap and small portable drawer unit, even one made of plastic (about $30) so people have a place to put a few things. I would say most AirBNB units now provide soap, shampoo and other things hotels often offer, like irons and umbrellas. To the rest of you, time to get with it. As long as some units don't provide things, it forces everybody to carry them "just in case" and it's usually not needed. Be clear in your listing if you do/don't provide things. Never say "double bed" and be clear about bed size. In Europe, most of the time a "double bed" is one the width of two twins, which is to say, a king sized bed. But in North America, a "double bed," sometimes known as a "full bed" is just 54 inches (137cm) while a queen is 152cm. Since Double can be confusing, just never use it. Call your beds king, queen, full or twin, and/or give their width in inches or cm. For people expecting a queen, a "full" bed, while two very friendly people can sleep in it, can be quite cramped. For those expecting a Euro-double (king) a US-double (full) can be unacceptable. And if your queen is pushed one side against the wall, it's not really very comfortable for a couple, and this should be made clear. I've had hosts who were pretty gruff, but I have had several hosts who are too helpful. As in they really want to be helpful, so they won't shut up, feeling they need to explain how the light switches work or how to find things that are in standard and obvious places. Watch to see if you are over-helping your guests, and scale it back. Just say you will be available by phone, text or email for any questions -- and be available -- and be available. One thing that's always nice when in a new location is to know the things it takes a local some time to learn. An AirBNB host can do well by making a document of local knowledge. You can print it out, or put it on a web page. You can also make it an overlay layer in Google maps, so they can be easily guided to anything you list for them. Here are some useful things that might be handy to know. The closest grocery stores, bakeries etc. Repair shops for electronics, shoes, clothes and an all-around hardware store. A few good restaurants nearby. The local dry cleaner or wash-and-fold, if there isn't a dryer. Something fun that's not in the tour books. Annotated google map layers are a great way to do this, and even to allow guests to add to the map. Instant book. Just do it. One of the largest problems with use of AirBNB is that it's work to find the right place, and then to go back and forth with the renter, often writing messages on properties that are not really available (both for ethical and unethical reasons.) That makes Instant Book a great boon, though it also has its issues. However, Instant Book is pretty much a must if you are looking for a property on short notice. You don't have time to shop. AirBNB could really help if it let people turn on Instant Book only for certain dates, in particular for dates less than N days away, like 3 or 4. Hosts would have to confirm the calendar and (alas) become unavailable at other sites, but they would get more bookings if they could do this. AirBNB could send them a note saying, "You are not booked for this weekend. If your calendar is correct, click here to turn on Instant Book." They can also adjust prices based on demand. Of course the challenge with all the booking sites is inaccurate calendars. People want to be able to list units on multiple sites and calendars get out of sync, and Instant Book can only be done on one. The hosting world needs a universal calendar that works with all the sites and is always accurate. It even needs to do something more difficult -- temporarily turn off instant book for a short time if a negotiation attempt comes in, since I have seen both properties grabbed when somebody forgot to turn it off, and people cancel an instant book because they were partway through a better offer. After cramming all my stuff into a carry-on bag for business travel, wrinkles are unavoidable. Looking good for meetings requires an iron and ironing board, which is absent from almost every AirBNB that I've used. as I'd just see them as yet another photo opp. So far, only in my dreams, and probably Germany and some points north.